Rock ‘N’ Roll Burger (hereafter referred to as R&R) is a small restaurant tucked slightly out of the way in Issaquah. There’s an old-school burger joint/Elvis theme going on in both the decor and on the menu. It’s just far enough off the beaten path that I’ve never driven by, but tonight I was craving a burger and made it happen. 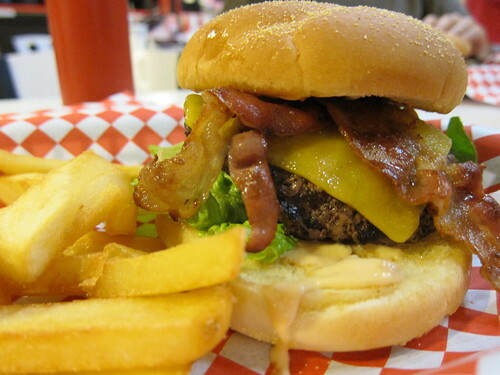 I ordered a #6 – a Hound Dog Burger – which is a burger with Tillamook cheddar, romaine, tomato, red onion, pickles (not on mine, please), R&R sauce, and bacon. R&R sauce is described as “mayo & 7 secret additives with smokey flavor”. The meat is “Premium, Fresh, 1/3 lb, 100% Ground Chuck”. I’m not sure what meaning if any the word “premium” when it comes to meat, and I’m hoping “fresh” means never-frozen but since they don’t say it’s hard to be sure. They offer to cook your burger to order but I decided to let R&R do it their way. When the tray was placed in front of me I had a very positive first impression – everything looked good. After a couple of bites I was enjoying the burger, but I wasn’t getting much beefy flavor. The veggies were quite good, the bacon was nice and crispy, but the other ingredients were overwhelming the beef. It felt like I was eating a 1/4 lb burger instead of a 1/3 lb. This was one of the few burgers that would’ve been better with a second patty to balance out the other ingredients. However, the overall result was satisfying. A few other details of note – the bun was good but needed to be toasted. The cheese wasn’t melted enough. The burger was a little overdone which left it dry. The fries were good, and the vanilla shake was definitely above-average. I’ll be going back. I get the Hound Dog, too. You’re right about the second patty. I usually don’t do doubles, but it kind of needs it. I do love sweet patato fries, though. Unfortunately, the Rock-n-Roll Burger has recently closed. So here is one I won’t get to try. Plenty of others left to keep me going though. Thanks.